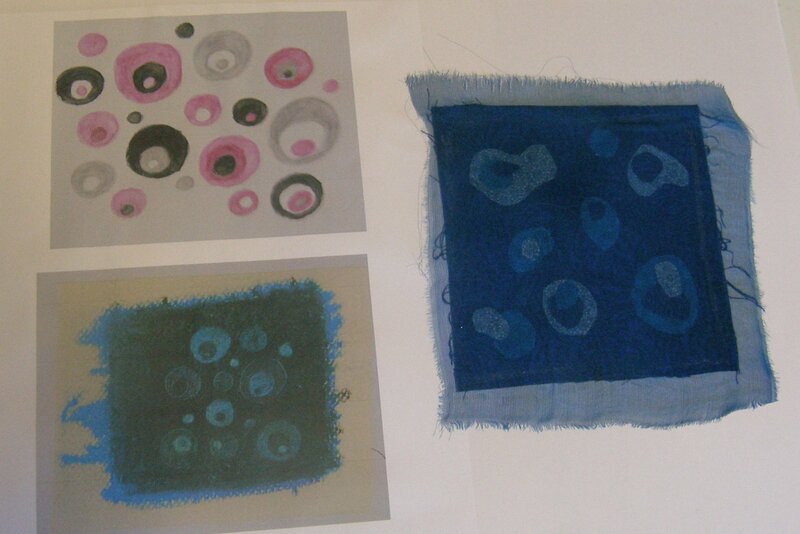 Stage 1 was to prepare fabric in colour groupings ready for stage 2 and as this has already been done for previous projects I have not taken more photos. 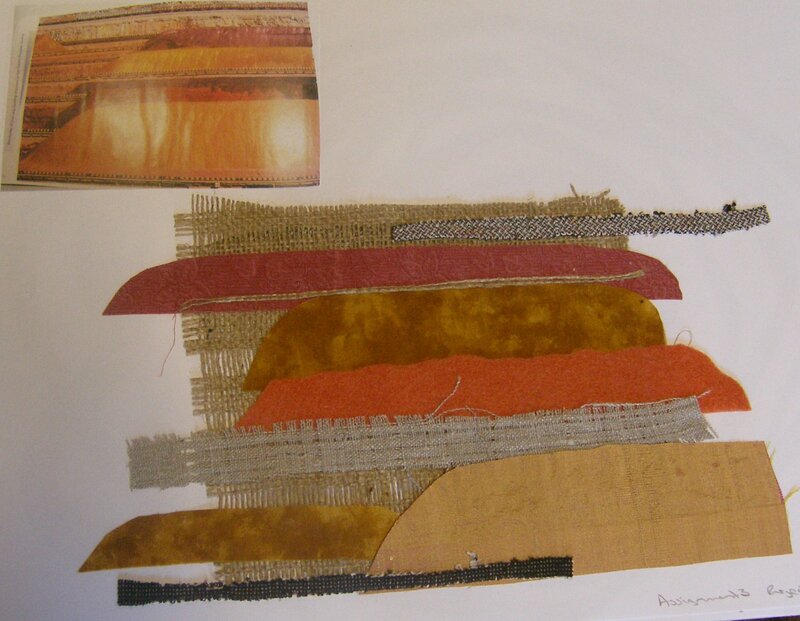 Stage 2 involves selecting 6 images from sketchbook or other work already done, and then looking through the fabric collections and seeing how different fabrics might match up to the images, creating rough collages from them. Image number 1 is a watercolour pencil sketch of a waterlily in our garden. I enlarged and photocopied the sketch and cut it into strips, then rearranged the strips and loosely wove them together. The fabric collage for this is a loose interpretation rather than a direct copy. I wanted to create the idea of the colours of the waterlily and a feel of movement in the strips by offsetting them, changing the width and layering them. 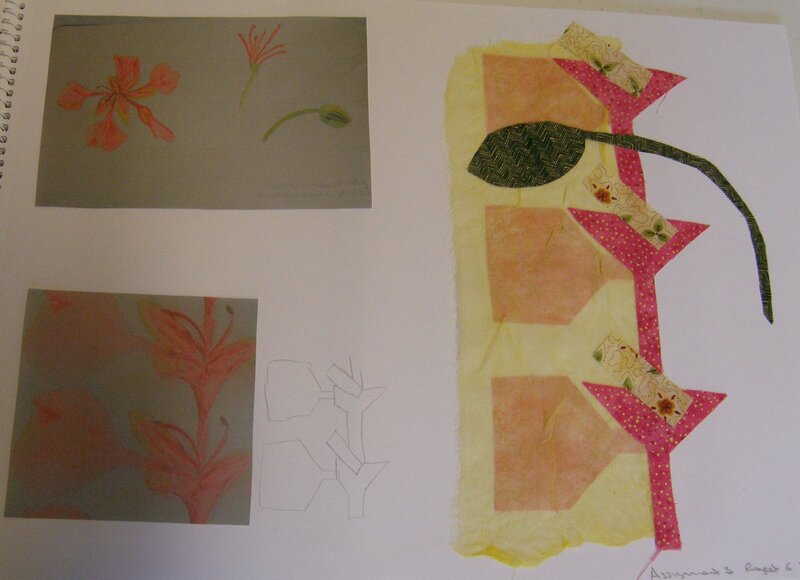 Movement is increased by scattering cuts of yellow fabric on top for the centre of the flower. I was pleased with this as an interpretation; it looks completely different from the sketch but is directly evolved from it. Image number 2 goes back to my circles sketch and the progression I did of this using oil pastels and scratching into the surface. I layered fabrics onto a base, but instead of cutting circles I made the shapes more random. 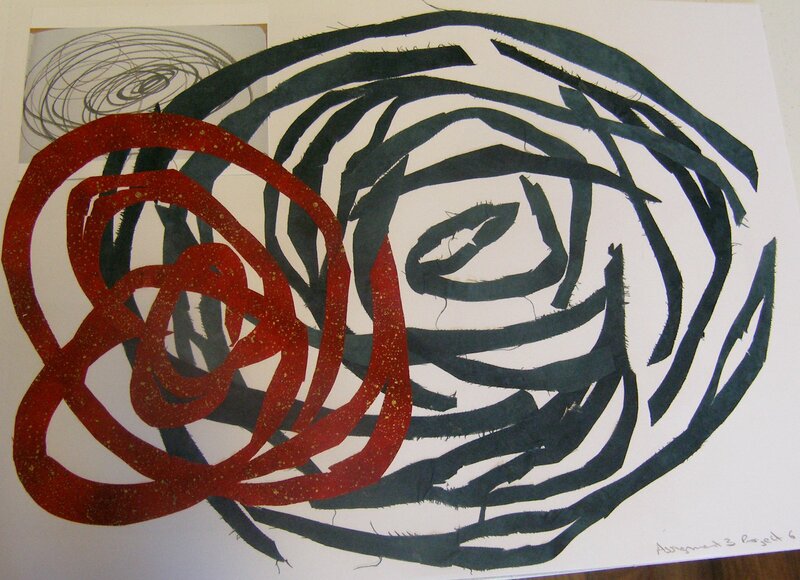 As with the waterlilly I wanted to recreate the feel of the piece rather than produce a copy. As the scratched pastels produce a faded effect, I used a top layer of chiffon to fade the whole piece. Image 3 used my Poinsianna flower sketch, taking a portion of this and manipulating it in Paintshop Pro. 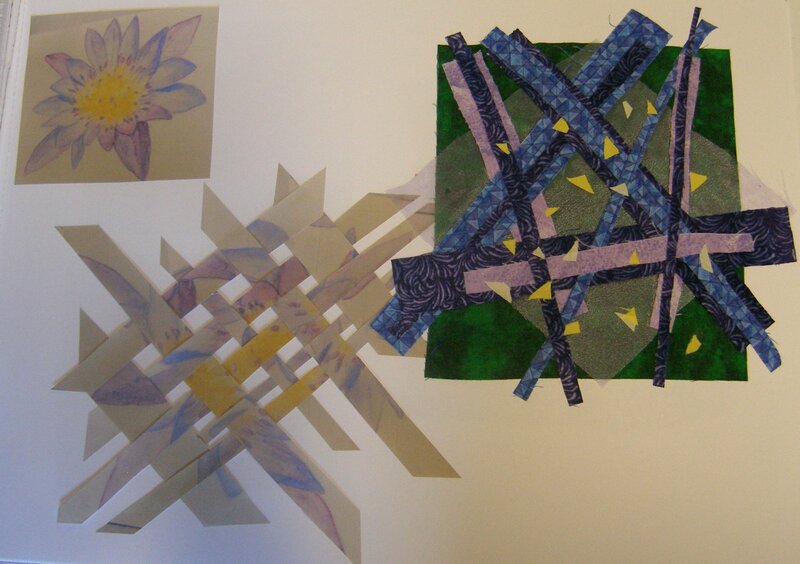 I then used cotton fabrics to make a repeating pattern with a sheer overlay on one pattern to reproduce the smudged effect in the photo and with a green flower bud on top to break up the repeat. Image 4 is not developed from a sketch but is a picture from a magazine article that shows piles of iron ore stockpiled at a mine site in Australia. I liked the colours in this, the linear theme and the varying widths of the blocks of iron ore. For this I recreated the feel by using a hessian backing with some of the threads removed. I layered a number of different fabrics on top including tweed (right side and wrong side), felt, cotton and linen (with more threads removed from the linen) to show the different textures of the iron ore. 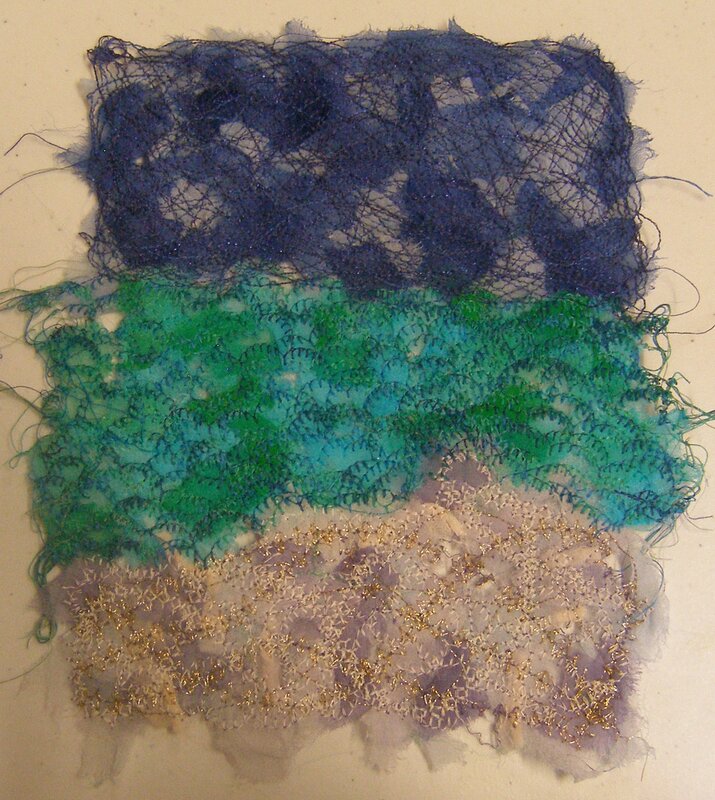 I enjoyed varying the textures of the fabrics in this work. I also think this image would work well with different threads and stitches used to represent the piles of iron ore. 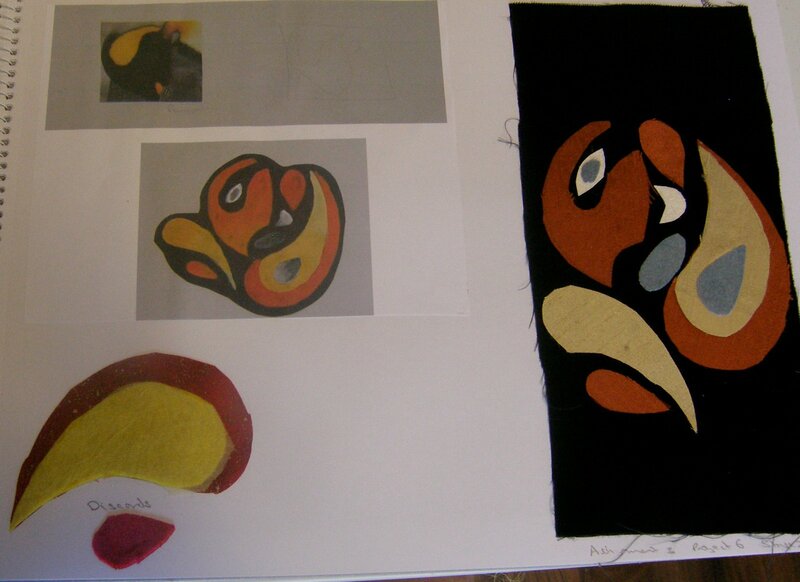 Image 5 takes the picture of the penguins that I split into shape/colour/texture studies earlier. I liked the painting I had done focusing on shape and colour and for this image I did try to recreate the painting in fabric so I matched up the colours as close as possible. I also wanted to get a luscious look so I used a black velvet for the backing to match the velvetyness of the penguin fur. I used silk dupion and microfibre for the other colours, again to get that soft lustre and texture. Image 6 was fun! I used a very basic sketch I did during Cyclone Olwyn, a fairly classic cyclonic mad swirl. To get the feel of power of the cyclone I used colours associated with anger and rage – red and black. I cut continuous spirals from each fabric and then cut these into smaller pieces and laid them straight onto the paper. This piece feels very powerful to me because of the colour, the movement and the emotion behind it. I decided to take this stage a bit further and explore creating collage for a photo I took when camping a few years back. It is a very straightforward beach scene. I dyed some silk chiffon and tore it into strips. Using a base of felt, I attached the chiffon strips to the base using Bondaweb. 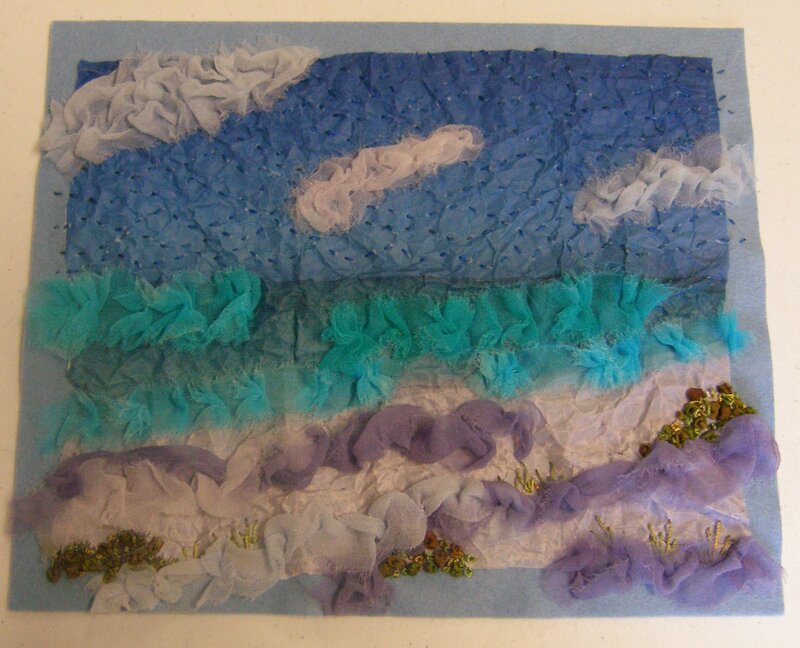 Then I hand stitched on top using basic running stitch in the sea and sky areas. The sea has some thicker rolls of chiffon in white and green to represent surf, and the sand area has ruffles in cream and lavender. The sand was too bland so I added some beads to represent shells and pebbles in the sand. 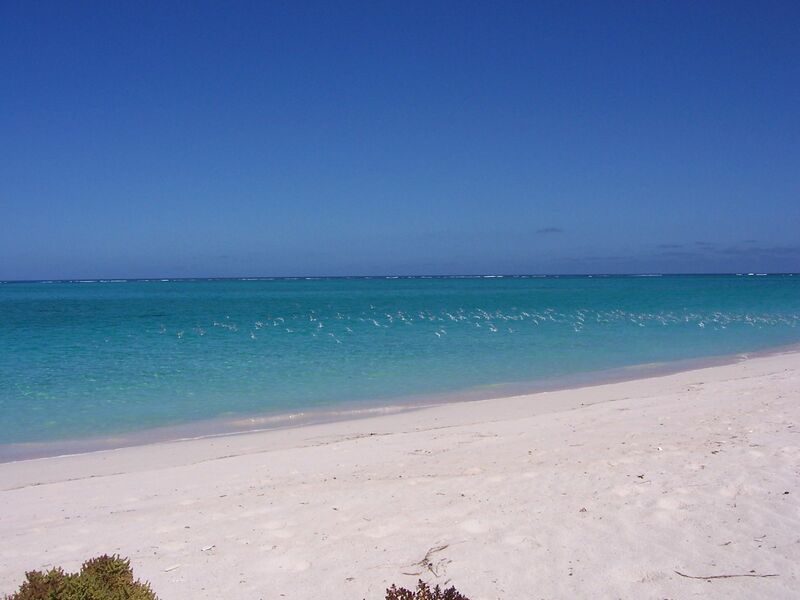 In the original photo above, there is a flock of seagulls above the sea. I included these in my interpretation by using back stitch and had them coming from the sky over the sea, getting larger as they get nearer. I like the result of this piece, it is peaceful and has been kept simple and not overworked. I could have improved it by dyeing another shade of blue for the sky so there was a gentler transition from dark to light. I did a second interpretation of the same photo, this time using the photo itself as the background, scrunched with oiled hands. I used the same chiffon strips. This time I exaggerated the lavender colours in the sand by using stronger purples alongside the cream chiffon. For the sea I used strong turquoise in uneven pleats. The sky was mostly left as paper, with some clouds being added in fabric. I only added extra stitch to the sky to break up the big areas of blue. I picked up the foreground bushes in the original photo and worked those in silk ribbon and thread French knots. I did a final interpretation of the photo using soluble fabric. I cut bits off the dyed chiffon and layered these on the soluble fabric base, then another piece of soluble fabric on top before stitching in the machine. I varied the machine stitches between each section to change the feel of each area. 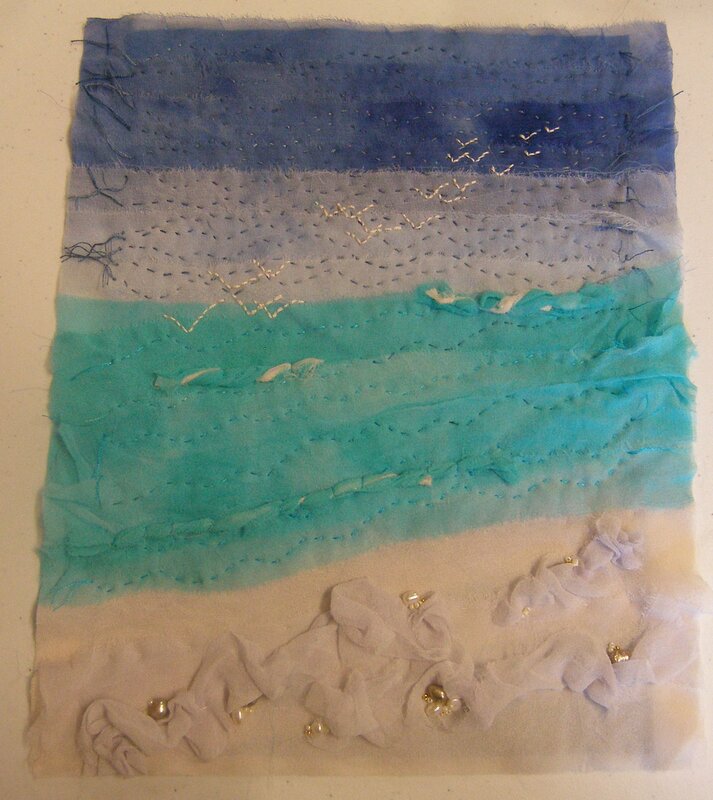 I liked the mingling of the fabric colours in this, for example I think the sand area worked well with the lavender and cream intermixed, but I think I used too much fabric. This technique lends itself to being more open and lacey, with holes left in it and my version filled these holes in too much.